I´ve been thinking a lot about exile during this trip and whether or not the term “exile” applies to couples who are not able to legally live together in the United States because of immigration problems. One of the American women I visited here recoiled a bit at the term, thinking she did not deserve recognition as an exile. She moved to her husband’s hometown after they realized he would not be eligible for residency or citizenship anytime soon. They live in a nice house, are surrounded by family and have broadband, and she’s not sure that counts as exile. But several of the Mexican partners I have spoken with have a different understanding of the term “exilio,” informed by a generation of bi-cultural and bi-national socialization between the U.S. and Mexico. Today I went to see where Leon Trotsky lived in exile in Mexico City. It’s at the end Vienna Street in the Coyoacan neighborhood. Trotsky hopped around the globe seeking asylum after he was targeted by the same Russian Revolution that he had helped set off. He went to New York for a few months, then back to Russia, then to Kazakhstan, the Turkish island of Prinkipo (where he got a lot of fishing in), to France, to Norway (where he was later put under house arrest) and finally to Mexico, which offered him political asylum. At first Trotsky and his wife took up with Diego Rivera and Frida Kahlo, who were, at the time, committed Trotskyites. They lived in the “Blue House,” which I also visited today. Apparently Trotsky and Diego had a falling out (over a woman perhaps? the museum failed to answer that question) and the Trotskys moved down the street to a fortified property which they soon filled with farm animals and barricades. Trotsky’s life in exile consisted of daily chores with the chickens and rabbits, 10 hours of writing and reading in his bunker-like office and politically charged dinners with his guards, collaborators and colleagues (which he called The Family). But he was also under constant threat of attack from enemies and eventually, an infiltrator (posing as a Belgian journalist and committed Trotskyite) who did him in with an ice axe. I’m a bit rusty on my Trotsky, but I’m quite sure he was my favorite Russian revolutionary in high school history class. I’m also a bit disappointed in the International Trotskyites for putting up such a lame display in his Mexican exile home. Walking along Vienna Street this afternoon I was having fantasies of discussing exile and revolution with a group of young Mexican Trotskyites over little glasses of espresso. But instead I had to sneak a picture of his writing desk with my iPod camera and step over disinterested Mexican teens making out while the docent reviewed the depressing Trotsky family tree (nearly all of his family was offed). After my tour of the Trotsky house, I went back over to Blue House where Diego Rivera’s people have put up a really great exhibit of his and Frida’s life there. Strangely enough, while trying to read one of their love letters, a young guy tapped me on the shoulder and said, “are you Nate Hoffman?” He’s a guy from Idaho who used to work at the Idaho Legislature and recognized me. We had coffee in Frida’s garden and he told me a bit about his “exile,” first in South Korea, where he taught English, and now in Mexico City where he is sort of learning Spanish, sort of biding his time and figuring out his next move. This is a very different concept of exile, but I would apply the term to his case as well (I’m not sure if he would, but I’ll ask him tomorrow night). Particularly when one is from Idaho, but really where ever one is from, a voluntary exile, a separation from the comfortable and familiar environs of home for something new, different, interesting or even dangerous is a form of exile. It has many of the hallmarks of classic exiles: bohemianism, acquisition of new languages and customs and eventual yearning for those very comforts of home which one escaped. Families who are not able to live together in the United States fall somewhere between these two examples of exile. They are not being forced to flee for their lives, though in some cases they are escorted to the border by armed guards. Nor are they sowing their wild oats. But they are experiencing rejection at home, finding their ways abroad and pining for the order and predictability of life in the U.S. while often reveling in the attitudes and customs of their life in exile. 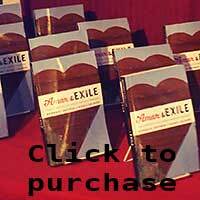 I’m looking for some more reading on the concept of exile, if anyone has suggestions. And I’m plotting my next exile as well, since I’m taking such a liberal reading of the term.